These immersion chillers are made up of 50ft 1/2"OD x .035 304/304L stainless steel tubing to a 10" diameter at an average height of 24". These are currently sold as the tubing itself with no additional hoses or fittings. Brass garden hose adapters are available for an additional cost. This is a first rate product. Very well done and very sturdy. The craftmanship is second to none that I have seen and its just as pictured, big shiny and all stainless. I will caution anyone using this though. Unless you are brewing larger batches in tall vessles, this might not be the ideal choice due to the height. a smaller version might be better. 50 feet of 1/2 tubing does take a little space. Communication is great with these guys and they are happy to answer any questions you have. I actually ordered additional products from them based on my first expierience. Good place to do business. I finally upgraded my immersion chiller from a 25' to a 50' and chose Stainless Brewing's model here. If you prefer stainless over copper like I do, this is an excellent choice. 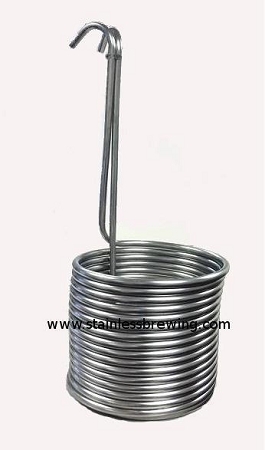 It fits a keggle with ease and has the capacity to cool down a 10+G batch in around 15-20 minutes. The manufacturing is top notch and it's easy to clean. I recommend the use of thick wall tubing and quick disconnects to a garden hose for easy plant watering! Zach at Stainless Brewing was great. I asked if the chiller could be modified slightly as I brew 20 gallon batches and wanted the coils to be raised up a little bit to reach the top of the wort. He said no problem and the chiller looks great. Used it twice now with a whirlpool attachment I added and it has worked perfectly. Very nice construction. My previous copper chiller, after 10+ years of use, failed catastrophically causing a lost batch of beer. I'm hoping stainless steel will hold up better. I've wanted to upgrade a 50' copper chiller to stainless for some time. I prefer a chiller coil rather than a welded plate exchanger because I can be sure the surface that touches wort is clean. Along the way, a large diameter coil that sits low in my 15 gal MoreBeer kettle would give me the flexibility to use it for large and small batches. When I met Zach at the 2015 National Homebrew Convention the light came on. Stainless's one downside is that it doesn't conduct heat nearly as well as copper. On the one 10 gal batch brewed with the new coil so far, it took about 25% longer to cool to pitching temperature compared to the copper coil it replaced. That's acceptable to me and I'm really happy with SB's cost, quality and service. Two thumbs up!" Just brewed my first batch using this chiller and it worked much faster than the 25' copper chiller I had been using. I recirculate ice water in my HLT through the chiller using a Harbor Freight submersible sump pump while whirlpooling the wort with my chugger. The chiller took 5 gallons of boiling wort down to 60F in no time. The chiller is well constructed with perfectly uniform coils and clean bends. Works great in my 44qt Bayou Classic boil kettle.